Most information systems today are databased. That's too bad for many companies because they are going to fall behind as their competitors build and deploy intelligent rule-based and knowledge-based applications. Data-based systems are limited to processing data and outputing information. The result is often information overload. Users don't know what information is really important, and they don't even know if they have all the information they need to make a good decision. Too many choices confuse people and slow down their decision-making process. Too many shopping carts are left behind as browsers give up and browse somewhere else. People want answers not more information. In databased systems, business rules are usually hard-wired in code, stored procedures, or triggers. Only programmers can change these rules. Rule-based systems are more powerful and more flexible than databased systems. They process data and rules to make decisions. They are good at processing lots of simplistic business rules, like pricing and promotion rules, and they can handle a broad scope of reasoning. They are best for real-time decision-making and decisioning applications. In rule-based systems, business rules are usually externalized so that business analysts and sometimes even SMEs can change the rules. Inference (IF/THEN) and pattern-matching rules are commonly used in rule-based systems. Knowledge-based systems are smarter than databased systems. They process data and use expert knowledge to output answers, recommendations, and expert advice. Customers get a personalized answer or product recommendation tailored to their unique requirements. Sellers get pre-qualified customers ready to buy. They are good at processing deep logic and very complex business rules. They can handle more complex rules and a deep scope of reasoning. In knowledge-based systems, business rules are externalized and can go beyond inference and pattern-matching rules. They can also handle probabilistic reasoning, case-based reasoning, fuzzy logic, and other advanced AI reasoning techniques. The more complex the business problem and the business rules are, the more likely a knowledge-based solution will work. 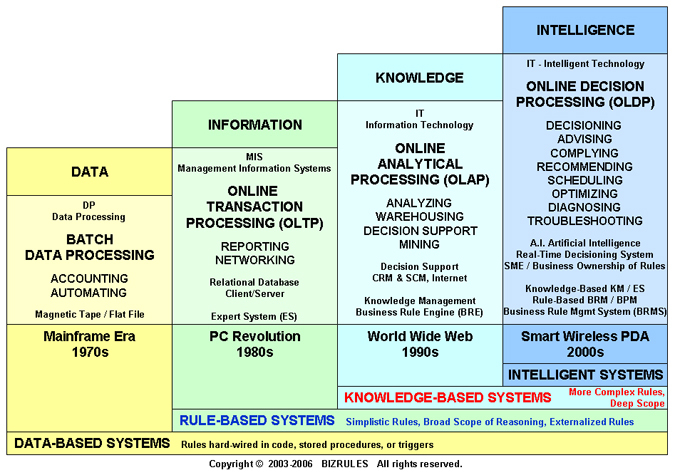 What is the difference between data-based, rule-based, and knowledge-based systems?